The Marconi Scandal is an episode that has disappeared down the memory hole of history. There are reasons for this, as will be explained. It was a very complex series of events that have been difficult to distil into a short article such as this without leaving out anything essential. Nonetheless, I believe I have condensed the most important events and actions in this sordid affair. Firstly, we must begin with a little background history. 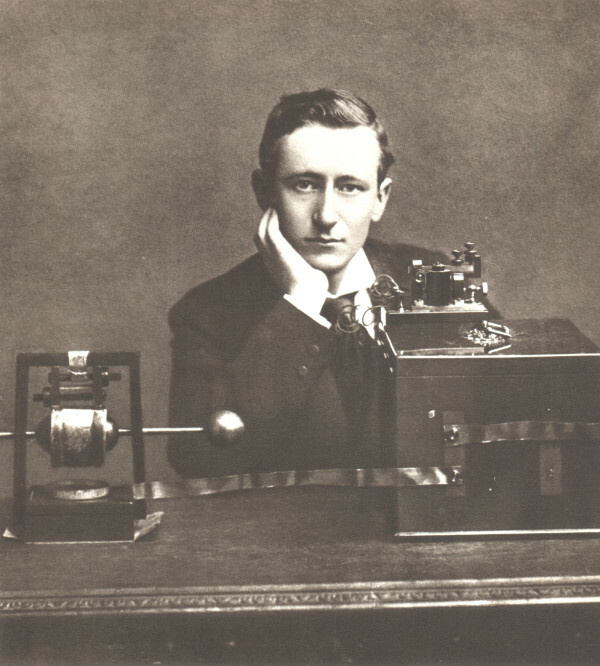 Guglielmo Marconi was a young Irish-Italian aristocrat of genius, who, at the age of 22, invented a crude form of wireless communication and offered it to the Italian government, who, in their ignorance, refused it. He came to Britain, where he founded the Marconi Wireless Telegraph Company and in 1901 made the first transatlantic wireless signal. 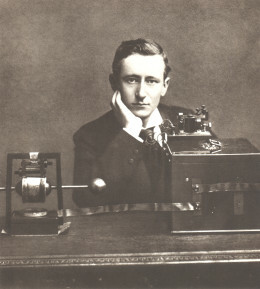 In spite of this, Marconi was making very little money and share prices were low, as the profits were put back into further experiments in wireless. Enter Godfrey Isaacs, well-acquainted with all the European financial houses – and, yes, he’s Jewish. Within six months of meeting Marconi, he was running the company. Within a couple of years, the Marconi Company had become a truly global concern. It is important to point out here, for reasons that will become clear, that each branch of Marconi operated as a separate company, but yet all were under Isaacs’ umbrella. Godfrey Isaacs also had a brother, “Sir” Rufus, who in 1910 had risen to the rank of Attorney General in the Liberal government of Great Britain. In 1911, the Imperial Conference approved the plan to erect state-owned wireless stations throughout the British Empire. The Postmaster General, the Jew Herbert Samuel was instructed to put the contract for the project out to tender. On March 7, 1912, Godfrey Isaacs’ tender on behalf of the Marconi Company was accepted. The contract took time and had to be tabled before the House of Commons upon completion, the date being set on July 19th. Immediately after the tender was accepted, Isaacs went to America to develop the American Marconi Company. The British Marconi Company held over 50% of its shares, which meant what was good for the British company was good for the American. Isaacs bought out the American company’s main rival with money from the British company, then sold it to the American company. The American company could then create two million shares, 500,000 of which Isaacs took responsibility for, and all of which were guaranteed by the British company. Isaacs then came back to Britain and told Rufus and his other brother Harry of his arrangements, selling 50,000 shares to Harry. Rufus refused, stating it would be improper, given his involvement in the Liberal government, but then bought 10,000 from Harry, which he apparently thought was fine. Rufus then sold 1000 to the Chancellor of the Exchequer and future Prime Minister, David Lloyd George, and 1000 to the Chief Whip, Lord Elibank. This was on the day before the shares were actually created. When the shares were put on public sale, they were 50% dearer. Rufus then acted as a stockbroker for Lloyd George and Elibank, buying and selling shares at a tidy profit. No records were kept of the transactions between the Isaacs, Lloyd George and Elibank. Elibank also bought 3000 shares for the Liberal Party itself from an unnamed source, all the time, we must remember, before the contract had been established and signed. What is also unusual is that between the time of the tender and the time the contract was to be tabled, Rufus Isaacs, the Attorney General, was brought into Prime Minister H. H. Asquith’s cabinet. Isaacs’ brother is chairman of the Marconi Company. It has therefore been secretly arranged between Isaacs and Samuel that the British people shall give the Marconi Company a very large sum of money through the agency of the said Samuel, and for the benefit of the said Isaacs. Incidentally, the monopoly that is about to be granted to Isaacs No.2, through the ardent charity of Isaacs No.1 and his colleague the Postmaster-General, is a monopoly using antiquated methods, the refusal of competing tenders far cheaper and far more efficient, and the saddling of this country with corruptly purchased goods, which happen to be inferior goods. Over four months have elapsed since the discussion in the House of Commons, but Ministers have done nothing whatsoever to dispel the mist of suspicion overhanging the affair. Mr. Samuel stated that Ministers “will be most ready to appear before”—I am quoting him—”the Committee.” One might have conceived that they would have appeared at its first sitting clamouring to state in the most categorical and emphatic manner that neither directly nor indirectly, in their own names or in other people’s names, have they had any transactions whatsoever, either in London, Dublin, New York, Amsterdam, Paris, or any other financial centre, in any shares in any Marconi Company throughout the negotiations with the Government. Mr. Leo Maxse, the eminent Editor of the National Review, protested vehemently against the way in which this disagreement had been concluded. He imputed that Mr. Herbert Samuel, the Postmaster-General, whose idea it was to enter into negotiations with the company, had entered into an arrangement with Sir Rufus Isaacs, the Attorney-General, also a member of the Government and brother of Mr. Godfrey Isaacs, managing director of the Marconi Company. All three had bought shares in the company at an average price of about 50 francs, at which these shares were quoted before the opening of the negotiations with the Government, and had resold them at a profit rising to as much as 200 francs per share according as the negotiations enabled it to be foreseen that the contract would be concluded. Mr. Maxse attacked at the same time the fact that the contract had been signed in haste on 7th March, without having been brought before Parliament as it should have been. This gave Rufus Isaacs charges he could easily defend himself against – charges that were completely fabricated – and, indeed, he did so, along with Samuel, at the hearing of the libel case against Le Matin, even though Le Matin had already printed a retraction in its London newspaper at the behest of Rufus himself. He also admitted freely to dealing in American Marconis to give the impression that all was above board. What is curious about the whole affair is that Rufus was in Paris when the clumsy libel was printed and back in London to oversee the retraction. It raises the question: did Rufus have the information for the story sent to the newspaper? I brought a libel action. From a journal in Alsace. The Outlook had not made. In the Young Turk’s Magazine. Is boiling in my head. It all at least served to speed up the Parliamentary Enquiry, the next session of which took place the following week. The Liberal politicians twisted, sweated and snarled throughout, Rufus flying into affected rage at questions about him not having mentioned buying American Marconi shares in the first session, while David Lloyd George insisted on having made a loss on his purchases, as did Rufus. What this had to do with the point was anyone’s guess and they had certainly not bought them with the intention of making a loss. Another interesting point to come out was whether the 500,000 shares Godfrey Isaacs held were his or the English Company’s. Godfrey claimed they were his, which meant him selling them at cost to others before they were put on public sale was fine; but where was the record of the transaction for the sale between him the Marconi Company? The company books were inspected, and it could not be found – it did not exist. During the various hearings, all manner of luminaries were called to give evidence from the worlds of journalism and politics. One last note about the parliamentary enquiry is that one of those luminaries was a certain Winston Churchill, whose name had also cropped up as one of those trading in Marconis. He appeared, denied everything, complained about insults to his honor and stormed off. And that was that. It was not the end of the matter for Cecil Chesterton, however, who had been pursuing the matter with some vigour in the New Witness. In particular, he saw Samuel and the Isaacs brothers as being the source of the corruption, as the tender had been arranged between them. Chesterton had also made much of the fact that Godfrey Isaacs had been at the head of or implicated in no less than twenty bankrupted companies, and someone with a sandwich board with words to this effect had wandered up and down the street outside Godfrey’s office. We are up against a very big thing. . . . You cannot have the honour (and the fun) of attacking powerfully entrenched interests without the cost. We have counted the cost; we counted it long ago. We think it good enough—much more than good enough. Judge: It is not an imputation against a man that he has been a failure. There is nothing in your libel to say that because Mr Godfrey Isaacs is a bad man of business, the Government ought not to deal with the Marconi Company. The allegations were that the prosecutor is a fraud and a cheat. Sir Edward Carson (Prosecutor): That he is a man that ought to be sent to gaol. Wild: That is what I am coming to. Judge: I have not seen the first part. Wild: (to Godfrey Isaacs) I suggest that you were not exploiting the public but these rich gentlemen? Isaacs: I was exploiting nobody, sir. Judge: How can you exploit rich people if you are not a promoter? Wild: The witness was in most of these companies from the start. Judge: That is not being a promoter. Isaacs: I do not think I ever invited people to put money into any one of these companies. I joined them myself as one of those who put money into somebody else’s company. Wild: Here are cases after cases of failure. Isaacs: That is my misfortune. Judge: You might as well cross-examine any speculative widow, Mr Wild. Wild: A speculative widow would not be concerned in the management. This last point reveals just how peculiar the governmental contract was: as Wild pointed out, there was a vast difference between Isaacs and a speculative widow and would Justice Phillimore have not thought it strange if the government had given a huge contract to that widow, especially if she had had close relatives in the cabinet and if the contract had been very favorable towards her? Another peculiarity of the case was that Chesterton wished to defend himself by showing Godfrey had engaged in misconduct, which meant that the burden of proof was now on him and not on Godfrey. Chesterton also wished to prove wrongdoing by those in government, in particular Samuel, Rufus Isaacs, and David Lloyd George, which, given the outcome of the parliamentary enquiry and that the Attorney General himself was in the witness box, was an impossibility. This might seem naïve of Chesterton, for he could not possibly win under such circumstances, but winning was not as important as showing the public how corrupt Britain’s institutions had become. Chesterton’s point of attack was the contract arranged between the government and Godfrey. Justice Phillimore immediately insisted that it had nothing to do with the case “whether the contract was badly drawn or improvident.” The jury, guided by the discourse made permissible by the judge, found against Chesterton. The judge, of course, could easily have sentenced Chesterton to a stretch in prison, but, given public attitudes to the case, fined him £100 and ordered him to pay Isaacs’ costs (which were not inconsiderable). The fines were paid for largely by his famous brother and generous members of the Conservative Party. Interestingly, this showed a disparity between those at the head of the party, who refused to press the Liberals on the issue in Parliament, and the lay members, who were outraged and did all they could to help Chesterton. This only confirmed Chesterton’s belief that those at the top of both parties were in cahoots and involved in activities to the detriment of the British public. One can see his point, for, through Herbert Samuel and other influential Jews, Semitophilic leaders, past and future, from both parties, such as David Lloyd George, Winston Churchill and Arthur Balfour, were all to come under the influence of Chaim Weizmann, the Zionist leader and future first president of Israel. As an epilogue, the fates of our protagonist and antagonists are important, for it shows just how corrupt the political establishment had become. David Lloyd George, of course, became Prime Minister. Herbert Samuel became 1st Viscount Samuel and 1st High Commissioner of Palestine, as Zionist Jews took charge of British affairs in the Middle East. Rufus Isaacs became 1st Marquis of Reading, Lord Chief Justice, Viceroy of India and, again critically, Foreign Secretary. In contrast, Cecil Chesterton died in a French hospital of infected wounds sustained in the field of battle in December 1918, believing he had served his country and the forces of liberty, when, like so many, he had unwittingly served the interests of the corrupt politicians he had once fought against, who had sent millions off not to war, but to an industrial slaughterhouse. He had insisted on marching in the victory parade, which exacerbated his injuries. Afterwards, Chesterton’s wife, Ada, dedicated herself to the poor, founding a shelter for homeless women. Over a period of years, substantial profits were reported, inordinately large fees paid to certain directors, and shareholders were lulled into a false sense of security by receiving appreciable dividends. Yet all the time, as it now turns out, the company was in fact suffering heavy losses by unwise investments (several of which had nothing to do with the company’s business), by advances to subsidiary companies which turned out to be bad debts, and by foolish speculation in foreign currencies. Not only is there any question of disliking any race, but there is not here even a question of disliking any individual. It does not raise the question of hating you; rather it would raise, in some strange fashion, the question of loving you. Has it ever occurred to you how much a good citizen would have to love you in order to tolerate you? Have you ever considered how warm, indeed how wild, must be our affection for the particular stray stock-broker who has somehow turned into a Lord Chief Justice, to be strong enough to make us accept him as Lord Chief Justice? It is not a question of how much we dislike you, but of how much we like you; of whether we like you more than England, more than Europe […] more than honour, more than freedom, more than facts. It is not, in short, a question of how much we dislike you, but of how far we can be expected to adore you, to die for you, to decay and degenerate for you; for your sake to be despised, for your sake to be despicable. Have you ever considered, in a moment of meditation, how curiously valuable you would have to be, that Englishmen should in comparison be careless of all the things you have corrupted, and indifferent to all the things that you may yet destroy? Are we to lose the War which we have already won? […] My fancy may be quite wrong; it is but one of the many attempts I have made to imagine and allow for an alien psychology in this matter; and if you, and Jews far worthier than you, are wise, they will not dismiss as Anti-Semitism what may well prove the last serious attempt to sympathise with Semitism. I allow for your position more than most men will allow for it; more, most assuredly, than most men will allow for it in the darker days that yet may come. It is utterly false to suggest that either I or a better man than I, whose work I now inherit, desired this disaster for you and yours, I wish you no such ghastly retribution. Daniel son of Isaac, Go in peace; but go. This article was first published in Candour Magazine, volume 75, number 4, issue 857.